Since insecticides have killed most bees in China's Sichuan province, local farmers are forced to fertilize the flowers themselves. But the "bee-men" may now be a dying breed. NANXIN — It is the height of pollination season in the orchards of China's southwestern Sichuan province. Perched on the apple trees' branches, farmers of the Nanxin village twist and turn to reach the flowers that are the furthest away. Doing what bees do anywhere else in the world requires a certain degree of agility. Zhen Xiuqiong, 56, has been climbing her and her neighbors' trees at the arrival of every spring for the past 20 years. Branches sometimes break, but Xiuqiong says she is never scared. To her, it's all a matter of getting used to it. Each year, all working-age villagers are summoned for hand-pollination. This spring, the activity started in mid-April and had to be completed before the 27th or the 28th. This strict timeframe, fixed by the weather and the flowering cycle, requires them to be fast. Even the oldest of these acrobatic villagers are dexterous enough that they can lay the pollen on every tree's flower in just half an hour. Such performance is necessary as each owner has between 100 and 200 apple trees. Zeng Zigao, 38, explains that the system is largely based on mutual assistance: relatives are asked for help during the time of the procedure. Yet the deadline is so close that he also has to employ seasonal workers — five to six people this year, whom he pays 80 RMB (9.2 euros) a day and provides meals for. “It’s an investment but if I miss the season, I won’t have enough fruits, so it’s a guarantee of productivity,” Zeng explains. The farmer considers himself lucky. In other orchards, workers are already asking for 100 RMB per day. 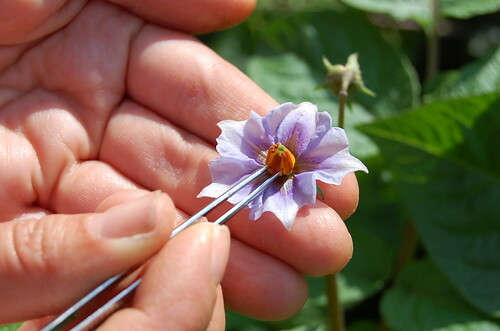 The best tool for hand-pollination is a shaft, at the end of which there is either a cigarette filter or the tip of an eraser pen. Around their necks, the “bee-men" and "bee-women" wear a small chewing-gum box filled with the pollen they gathered from other apple trees' flowers, before drying it out in the sun and grinding it. In other Chinese regions, people can buy pollen from middlemen, but, in Nanxin, they think their powder might be of low quality. Pollen loses its fertility quickly, sometimes even before reaching its destination. These cultivators hide nothing about their techniques. Yet when it comes to the reasons that force them to replace insects, their answers become vaguer. From the top of his tree, Kang Zhaogui, 49, claims that the fall of the bee population has been clear here since the 1990s. Some journalists have not hesitated to make a connection with the Great Leap Forward, a campaign launched by Mao Zedong in 1958 that led to the Great Famine. Chinese people were asked to get rid of the sparrows that were “stealing” people’s grains, which, in turn, led to the proliferation of insects — and, eventually, to the mass spraying of insecticides. Yet none of the Chinese researchers that studied hand-pollination gives any credit whatsoever to this theory. What happened, then? The first possible explanation is that the surface area of forests — bees' natural habitat — has shrunk in favor of fields in the region over the last few decades. This territorial deficit doesn't explain everything. In reality, poorly-educated farmers largely use phytosanitary products to eliminate insects that may harm their fruits. They prefer spreading too much than not enough as their income mainly depends on their harvest. With 0.08 hectare of arable land per inhabitant in China (compared to 0.28 in France and 0.51 in the U.S., according to the World Bank), “farmers want to use their fields in the most intense way possible,” says Tang Ya, a professor at Sichuan University. Hand-pollination also enables farmers to guarantee cross-fertilization with the most popular varieties of apples on the market. Treating each flower meticulously guarantees a tree full of fruit when the time to harvest has come. An Jiandong, a researcher from the Department of Apiculture at the Chinese Academy of Agricultural Sciences, notes that, to this day, no legitimate study on the decline of pollinators in China has been conducted. “Hand-pollination requires a large workforce and bees understand plants a lot better than humans,” Jiandong says. Zhen Xiuqiong, the farmer perched on her branch, sees irony in the situation — her husband is a beekeeper. He rents out his bees to certain orchards in the region, but he will never let them gather pollen on the trees that keep his wife so busy. She is heavy-handed when it comes to insecticides. "If the bees pollinated here, they would die," Zhen says. Her neighbor, Kang Zhaogui, agrees, saying it should be required to destroy the chemicals before the flowers blossom, so that no one renting out their bees would risk losing them in a plantation. At a time when the low quality of farm-produced food has become a major political issue in China, the residents of Nanxin acknowledge that the authorities have become stricter when it comes to fruit control. As a result, farmers now tend to use less powerful insecticides — even though some admit they compensate by spraying more often. According to Professor Tang, who often goes to Nanxin, the socio-economic changes that China is currently experiencing are making hand-pollination more and more costly. When farmers started doing it at the end of the 1980s, the expenses seemed insignificant. The increasing cost of living is already forcing villagers to turn to other, more profitable fruits. If apples are sold for only one RMB per pound (0.12 euros) to wholesalers, cherries can reach a price up to 20 times higher. According to the scientist, the rapid wage growth could discourage farmers from resorting to hand-pollination. Travelling beekeepers renting out their bees could replace the “bee-men,” on the condition that residents accept to decrease their use of toxic agents. But, most importantly, Tang observes that the younger generation is more attracted to the city lights than to the prospect of working as a beekeeper carrying his hives from one village to another. All these elements, the environmental expert hopes, could encourage farmers to adopt “sustainable” practices, that would likely allow bees to resume their work.